Normally I don’t write two posts in one day, but I just have to get this out. Do you ever feel empty? Like one day you could wake up and just float away? It’s been one of those nights for me. I just feel like there’s an empty space in me that hasn’t been filled yet. I know that that sounds sad, and it is. But I feel like I keep looking for things to fill the empty place in me. People, places, music, words. Nothing helps. I’ve been told numerous times that there comes a time when people just need to accept themselves. But how can I accept a part of myself that’s not complete yet? It hurts, you know…this empty space. It hurts my heart. It makes me cry. It makes me feel all alone (even though I know there are so many people around that love me and support me every day). I think that makes it even harder. Having such wonderful people in my life and still feeling empty. There used to be a time when writing half-filled the empty space. It gave me the chance to let out all my feelings openly and without judgement. That’s sorta what this blog has become in a sense. But writing isn’t filling the space. I feel it still. I feel it every day. And I just want it to go away. Go away or be filled. Sometimes, when I’m really really happy, I forget it’s empty. I forget…just for a second…that there’s a part of me that doesn’t feel complete. I know this all sounds weird, but I just have needed to write it out today. I’ve cried enough today to fill an ocean, and at this point, I can’t cry anymore, but yet it still hurts. I’ve been missing people recently, and maybe that has something to do with it, but I don’t know. The hard thing is that I’m happy here. I love Asheville and all the great friends I’ve made here. But yet, there’s this space in me that longs to be filled. With what….I have no idea. The thought of using even more energy to go and figure out what’s missing just seems impossible. The search…the search that has only led to disappointment is draining. I’m emotionally spent. The tears are gone. And all I can do is put one foot in front of the other and remember to breathe. That’s all I can do. The Dog Days Are Over. It’s a music day today. Last night, I listened to numerous songs by Florence and The Machine. I had listened to her before, but it wasn’t until last night that I discovered how great she is. She’s a lot like Adele in her voice, but I feel like her unpredictability makes her better. Some of her songs are quiet, and some are loud. As I was listening to them last night (“Cosmic Love” and “You’ve Got The Love”) I became more motivated. I got a lot of work done that I needed to, which was definitely a plus. And what was left after that too. oh. Check it out on Youtube. It’s an amazing song, and it’s fun to dance to! Are those snowflakes I see?! It’s official. At approximately 3:30 this afternoon, I spotted the first snowflakes of the season! Even though it’s not sticking and it’s only snowing off and on, it’s so pretty. I’ve opened my window so that I can smell the amazing snow-filled air. This is quite a treat for me. I’m originally from South Carolina where it doesn’t snow much, so I’ve been looking forward to winter in Asheville for quite some time. The fact that it’s snowed today has also made me realize just how close Christmas is. So, I’m sitting in my room watching the snow and listening to Christmas music. I still can’t believe it’s that time of year again. I feel like it was just Halloween a few days ago. This semester has flown by, which is both a blessing and a bummer. I’ve loved my first semester at Asheville, but I’m also reaching the point of just being totally burned out, so I’m just ready to be done already. I want to get these papers and projects out of the way so that all I have to do is get excited about Key West. Me, my parents, my brother, my brother’s girlfriend, and my friend Heather are all going to Key West for a few days before Christmas. I’m really looking forward to it. It’ll be nice to have a fun trip to get excited for the holiday season. Plus, I haven’t seen my friend Heather since before Thanksgiving so I really miss her. Current Christmas Music: Last Christmas by Taylor Swift. I’m a HUGE Taylor Swift fan, and I’ve always really loved her Christmas music, so it’s a win-win. What’s your favorite part about the holidays? Have you started getting into the Christmas spirit yet? It’s been a rainy day here in Asheville. Not drizzling rain, but the yucky, pouring rain that soaks your shoes and makes you just want to be curled up inside watching a movie. Normally, I like rain. And rain in the mountains has always been special for me. But I think the fact that it is Monday and has been pouring rain all day is reason enough to not be in the best of moods. But the great thing is that small things can sometimes brighten even the darkest of days. For instance, I found out today that both of my classes on Wednesday are cancelled. I don’t know about you, but that’s definitely reason enough for a smile! Also, I just started listening to all my Christmas stations on Pandora, and I guarantee that by the end of the night I will have had at least one dance session in my room. Isn’t Christmas music just the best? It’s super cheery (most of it) and reminds me of cookies and the smell of trees and cooking and family time. Ah, so much fun! And I’m definitely thinking that I need to really get in the Christmas spirit this year. Ya know, peppermint coffee, Christmas music, going to the Biltmore to see Christmas lights (apparently their Christmas light display is amazing), make a gingerbread house, watch Christmas movies. Yeah, I’m smiling just thinking about it all. What do you do to get ready for the holidays? Instead of Waiting, Take Notice. Waiting can be one of the hardest parts of life. Whether we’re waiting to go somewhere, feel something, find something, or if we have no idea what we’re waiting for, it can make us crazy. It’s human nature to be a little impatient, but there are those who are incredibly impatient. Those are the people who would benefit from slowing down, slowing down to realize what’s right in front of them. So, take notice of what’s around you. Drink it in. Take a big gulp. Savor every drop. Because the life that you’re waiting on to start, it’s already started. You’re in it right now. And maybe right now it’s not going the way you want it to go. But that’s okay. You’re in control. You can change it (to a certain extent). You don’t have to wait for a big event to occur in order to realize that the life you have now isn’t one that you want. What I’ve noticed today: the wonderful weather, appreciating the fact that I live in Asheville, my amazing family, not having too much traffic on my drive back to school, the smile I got from the nice lady at the pharmacy, the fact that 3 weeks from now I’ll be leaving for Key West, and the fact that there are only 16 days left until Christmas Break. Tomorrow’s a new day, but there will never be a day that’s identical to this one. So live it. Take notice of everything you possibly can. I feel like many times moving through sadness is like being in a crowd. People may be around you, but you’re so focused on just putting one foot in front of the other that you don’t even notice those around you. It’s like there’s a piece of glass between you and everyone else. You know they are there, but having the energy to reach for them, to need them…seems impossible. That’s the thing about sadness. No matter how much we think it’s easiest to go it alone, it’s not. We all need support, every one of us. And maybe support doesn’t mean spoken advice or even being in the same vacinity as the person who’s hurting. Maybe support means finding comfort in silence, comfort through words that don’t even have to be spoken aloud to still be true. And no matter how much we run from people because we feel like dealing with our sadness is easiest alone, we always come back. Whether we come running back, or skulking back, we come back. Because facing sadness by having another person carrying some of the weight is 100 times better, without even having to crack open our hearts to watch the sadness seep out on to the floor. Truest are the friends who need not speak a word to offer comfort. The ones who are there, and neither of you have to even say anything. It’s a bond that doesn’t need words or acknowledgement. It’s having the ability to find comfort in silence. A Jar Full Of Stars. “Dark clouds may hang on me sometimes, but I’ll work it out.”-Dave Matthews Band. Though I feel like many of my posts have been about finding happiness in the simple things, tonight it was true example of doing just that. I had a hard, but rewarding day of hiking to a nearby waterfall with my family. 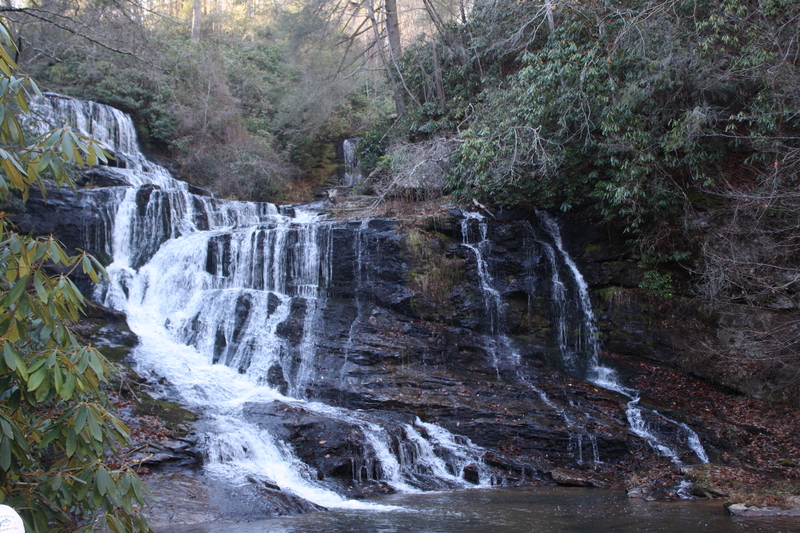 The waterfall was just as pretty as I remember it being as a kid, but the trek there and back was difficult for me. Yes, I did it, but I’m definitely feeling the effects of it now. However, that’s beside the point. Anyway, when my parents and I got back to our mountain house, I got out of the car. The first thing I did was look straight up to see a dark sky filled with stars. Since we live out in the woods and not many people live near us, it’s dark enough out to see the stars, and it honestly took my breath away. I felt like I could just reach up and grab some stars and put them in a jar. A jar full of stars all for me. Yes, star-gazing is a very simple act, but it brought me happiness today. I had a hard day of hiking, and I feel like it was all worth it because at the end of a good day with my family I got to see a sky full of stars. No, stars are not foreign to me, but since I live in Asheville, I don’t see the stars much. Though I love Asheville, I didn’t realize how much the city lights can obscure your view of the stars. So, it was a nice treat tonight to gaze up and be able to just be filled with happiness. What simple thing has brought you happiness today?